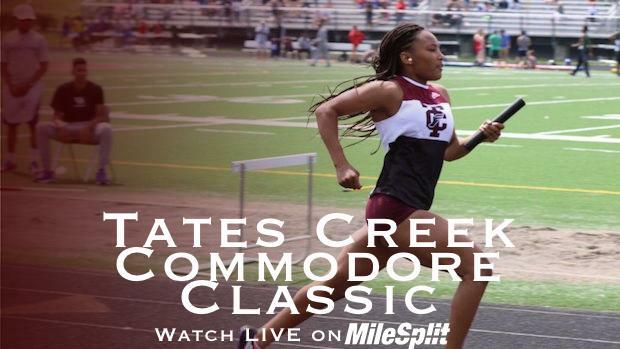 2019 Commodore Classic will be LIVE on KYtrackXC! Thank you for your interest in attending the Tates Creek Commodore Classic. THIS YEAR WE WILL BE DOING UNIFIED EVENTS (where there is interest). Entires close at midnight on Wednesday, April 10th. Faxed or written entries will not be accepted. Competitor numbers will be assigned and emailed to coaches prior to the meet. They will also be available in the packets handed out at the coaches meeting. You may also bring them on the day of the meet. Meet Format: Running and field events will be in the regular order on a rolling schedule. WE WILL HAVE UNIFIED EVENTS. We will hold the 100m, 4x100m, 400m, Shot Put and Long Jump. Awards: There will be a team awards for the 1st and 2nd place teams on the girls' and the boys' side. Medals will be awarded to the top three finishers in each event with ribbons for fourth through sixth. Entries: Each team may enter 2 athletes per event and 1 relay team. Athletes may only be entered into 4 events total including relays. I am happy to answer any questions or concerns you have. We look forward to having a great meet with stellar competition.